The Tourism Management Diploma at Okanagan College is designed to give students real-world knowledge, skills and opportunities designed to advance careers in the tourism sector. Upon graduation, students will be ideally suited for supervisory or front-line management positions in tourism. Build a strong foundation in core tourism and business management functions. Network and build connections within the sector. 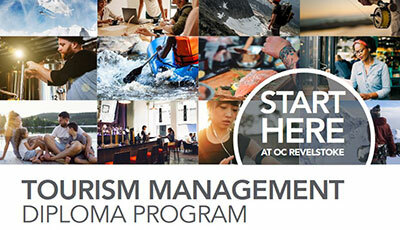 Get practical knowledge through a six-credit faculty supervised tourism sector study course. Advance your career in the tourism industry through a paid co-op placement. Work and learn in a diverse and dynamic four-season tourism environment. At this information session, learn more about the innovative new program, chat with staff from the Okanagan School of Business, and discuss opportunities for changing your work visa to student visa. Why study with the Okanagan School of Business? Build industry experience and connections while you study. Work and learn in a diverse and dynamic four-season tourism economy. Explore opportunities in a wide array of tourism related roles, from the mountain to the city.